Where Holzfällen (Woodcutters) looked at the theatre and Alte Meister (The Old Masters) gave us an insight into the world of art, Der Untergeher (The Loser) is focused on music, more specifically on the lives of concert pianists. The novel is narrated by a middle-aged Austrian expatriate who has returned to his home country after several years in Madrid in order to attend the funeral of his old friend, Wertheimer. 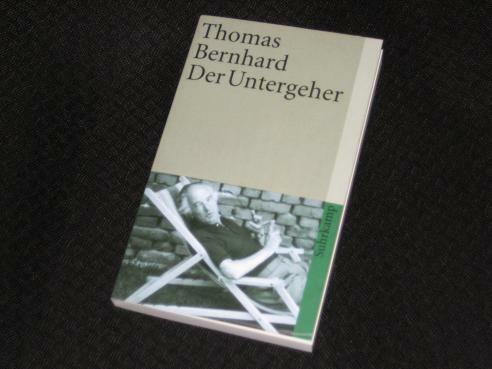 Der Untergeher is another of Bernhard’s slow-moving books, with the ‘real’ action of the narrator’s visit to Wertheimer’s country retreat taking up the whole book (much of which occurs in the time it takes the owner of the guesthouse he wants to stay at to realise that he’s waiting at the counter…). Of course, this is because most of the story happens in the narrator’s head in the form of memories, circular reminiscences of a style which will delight Bernhard fans but infuriate those with a passion for more linear texts. The drive of genius forces Gould ever onwards, and Bernhard’s narrator describes a man whose quest for perfection eventually destroys him. When Gould dies of a stroke at his piano, the narrator suggests that this is death through mental exhaustion, with the maestro consumed by his music. While Gould’s name makes the book stand out, in truth, he’s a minor character here, important mainly for the role he plays in the two friends’ lives. Gould is the one who bestows the nickname of Der Untergeher on the hapless Wertheimer, and the Austrian, from the first moment he hears Gould play, is tormented by the knowledge he’ll never be as good as the Canadian. From that chance encounter in Salzburg, he knows he is fated to fail in his quest to become a world-renowned artist. What follows, then, is a portrait of a desperate man who, despite his wealth and talent, is doomed to misery, and an early grave. Wertheimer is morose, self-destructive and incredibly selfish; one of the more important events in the second half of the book describes his efforts to keep his sister with him for ever, and her eventual flight to marry a Swiss businessman. Bernhard paints the portrait of an egotist, with this image gradually transforming into that of a wealthy man with nothing to live for. When you add this bile to the usual mesmeric, circular motion of the story, what eventuates is a strangely comforting read, the enjoyment of the familiar (which is an idea Bernhard would not have approved of!). He is a very funny writer, dark and mocking, and I like that about him, but as mentioned above, this narrator doesn’t feel quite as biting and indestructible as the others I’ve read. Grant – It’s a wonderful read, and I love the way the set up culminates in such a banal finale (although my version of it last year ended even more abruptly!). yes, it’s one of his quieter reads, almost contemplative. I felt (oh my memory) that this one is more connected to the Kalkwerk (is it Kalkwerk or Korrektur that I’m thinking of), no? I have always been a bit annoyed by some of the stylistic quirks in this one. If I remember correctly, it’s full of “und dann sagte ich mir..” or “sagte ich ihm”, much more stuff here is, to quote Bishop “only connected by “and” and “and” than in his other work. At the same time, this is one of the emotionally more intense books of Bernhard’s, I always thought. Shigekuni – There is a lot of that here, and while that’s also true for the others I’ve read, it feels more like padding here, where in the others it added to the atmosphere and tension. It’s good, of course, but I felt ‘Holzfällen’ and ‘Alte Meister’ were much sharper (and nastier!). Of course Bernhard gets what he’s doing, and to characterize him as “grumpy” is rather silly. You’re much more on point when you mention that he’s funny, dark, and mocking. What he does, in part, is to create polyphonic narratives all of which are lap and overlap each other in one huge musical score the reader must hear in his or her head. One of the few truly great writers in the latter of half of the twentieth century amidst of sea of drek.